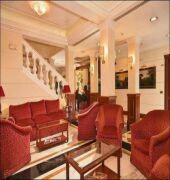 The 4-star Hotel Barberini is located right in the heart of Rome just a stone throw away from the Spanish steps, Trevi fountain, Coliseum, Pantheon, Roman Forum and other city musts. Here lovely pedestrian lanes abound in traditional Italian trattorias, restaurants and little boutiques. The 19th century building of the hotel determines the classier style of its interior maintained in rich golden and deep blue with wooden adorning and luxurious antique furnishings. Large and sumptuous guestrooms have modern marbled bathrooms, hairdryers, bathrobes, exquisite linens, separate sitting area, air conditioning, Wi-Fi, satellite LCD TV, safe and minibar. Moreover, there is a varied buffet breakfast at the rooftop breakfast room with terrace with breathtaking views on the Palazzo Barberini and historical of Rome. 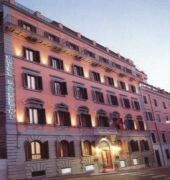 The BARBERINI HOTEL is a Tourist hotel. Located in ROME area. Shopping is within walking distance and the nightlife/restaurants are located in the hotel. 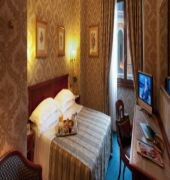 Descriptionclass="small" style="text-align: justify; font-size:11px;">The 4-star Hotel Barberini is located right in the heart of Rome just a stone throw away from the Spanish steps, Trevi fountain, Coliseum, Pantheon, Roman Forum and other city musts. Here lovely pedestrian lanes abound in traditional Italian trattorias, restaurants and little boutiques. 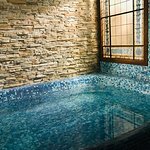 The 19th century building of the hotel determines the classier style of its interior maintained in rich golden and deep blue with wooden adorning and luxurious antique furnishings. Large and sumptuous guestrooms have modern marbled bathrooms, hairdryers, bathrobes, exquisite linens, separate sitting area, air conditioning, Wi-Fi, satellite LCD TV, safe and minibar. 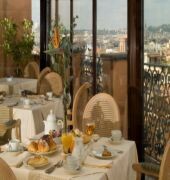 Moreover, there is a varied buffet breakfast at the rooftop breakfast room with terrace with breathtaking views on the Palazzo Barberini and historical of Rome. We spent 7 nights in this wonderful hotel. The staff was very helpful and assisted us with dinner reservations and generally in all we needed. When we asked for an extra towel or coffee it was brought to the room within minutes. The room itself was overlooking the street. It is modern and clean, comfortable bed, very nice and spacious bathroom. The room has a mini bar that is not overly expensive, there is a kettle with tea and coffee. Breakfast is served on the top floor with a beautiful view of Rome. What an experience eating breakfast and looking at Basilica S. Pietro on one side and the trees of Villa Borghese Park on the other. The breakfast bar team is wonderful as well, always with a smile. We will definitely be back the next time we are in Rome. I am thrilled to read of what a wonderful experience you had at The Barberini. Thank you for your extensive and charming review and compliments toward the team and facilities of the hotel. Your special mention of the staff members that stood out is very kind, and I can't wait to share your review with them. It has been an absolute pleasure to read your fantastic review and I hope to have the opportunity to welcome you back to The Barberini Hotel in the not too distant future. Luxurious hotel, excellent breakfast, comfortable rooms, great location for tourism and staff were friendly. The breakfast area has panoramic views, thereâ€™s a wide selection of food and drink including Prosecco! Thank you so much for your wonderful feedback regarding your recent stay at our beautiful hotel. It is wonderful to hear about your exceptional Hotel Barberini experience & I am pleased that our central location within walking distance of so many interesting places was so convenient for you. Nice hotel nearby to Fontana di Trevi. Nice, cosy and clean room. Nice and helpful staff. They gave us on map the best tourist attractions. Restaurant with nice food and good service. We had very nice weather that made our stay perfect. I would like to thank you first for staying at Hotel Barberini. We really appreciate your kind gratitude about our cleanliness ,our foods selection, our staff... It's really fantastic that everything was to your liking! 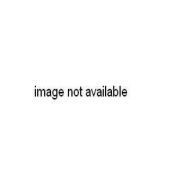 I will share your nice words with everybody as these comments make our day! We are proud to know you were fully satisfied with your experience at Hotel Barberini! Barberini - still gracious hosts! We stayed here with 2 young children and strongly recommend to families and couples. The itself room was beautiful and opulent. The staff was so pleasant and very helpful. We loved the rooftop restaurant for breakfast each morning overlooking St. Peter's and beautiful vistas of Rome. My kids are still talking about those breakfasts out on the terrace with the "owls"! The Barberini "bee" candy is an added bonus - I found a couple in my suitcase last month and we were all excited to have one last treat. I saved the wrapper for our scrapbook! The hotel and staff were very helpful and accommodating. The rooms were clean and beds were comfortable. The mobile phones in the room was very helpful for navigating through the busy streets of Rome and outside of Rome. Breakfast was of a good standard with a variety of foods. Overall a good stay and value for money. Very central to all tourist sites and maps are available at reception.